Homer L. Teegarden, 93, passed away on Tuesday, January 29, 2019. He was born on July 23, 1925, in Jonesboro, Indiana, to the late Paul and Lucille (Norris) Teegarden. He graduated from Jonesboro High School (Zebra's). Homer was a Marine and was active during WWII. He was a mail carrier for the city of Jonesboro and worked in housekeeping at the Marion VA for over 20 years. Homer married Judy Teegarden (Thorn), on March 23, 1972, in Marion, Indiana. They were members of the Woodland Hills Church of Christ. Homer was the former District 25 Governor of the Lions Club in 1972. He was a founder of the former Twin City Lions Club. He was a member of the Fairmount Lions Club, State Leader Dog, and State Cancer Lions Club. 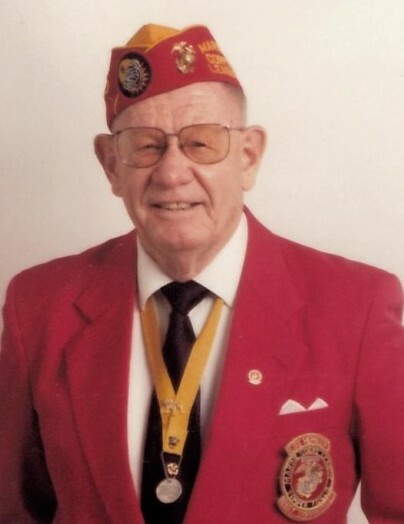 He was a founder of the Grant County Marine Corp League, State Commander of the State Marine Corp League, a Mississinewa Community Schools board member, a basketball referee and a little league coach. Homer is survived by his wife, Judy Teegarden, Jonesboro; sons, David L. (Carol Ann) Teegarden, Hemet, CA; Kip Flynn, Fairmount, IN; and Matthew Scott Flynn, San Fransisco, CA; daughter, Gina Birky (Flynn), Jonesboro, IN; daughter-in-law, Carol Jean Teegarden, Gas City, IN; grandchildren, Becky (Seth) Runyon, McCordsville, IN; Leslie (Jake) Grubb, Marion, IN; Sarah (Rich) Smolen, Philadelphia, PA, Erin (Brad) Wolbeck, Hemet, CA; Tara (Josh) Lockett, Marion, IN; Ti Flynn, Marion, IN; Michelle Rose Birkly, Daytona, FL; Christopher Henry Birky, Los Angeles, CA; Isaac Aaron Scott, Jonesboro, IN; sister, Irene Davis (Teegarden), Fairmount, IN; brother, Bud (Maggie) Teegarden, Jonesboro, IN; fourteen great-grandchildren and 5 great-great-grandchildren. He was preceded in death by his son, Gary L. Teegarden, his granddaughter, Nicole M. Birky, his brother, George Teegarden and his first wife, Bette (Eck) Teegarden December 24, 1970. Arrangements for Homer have been entrusted to the College Park Chapel of Armes-Hunt Funeral Home & Cremation Services, 4601 S. Western Avenue, Marion, Indiana 46953, where a visitation will be held on Sunday, February 3, 2019, from 2:00 - 8:00 P.M. A Funeral service will be held at the Woodland Hills Church of Christ, 2718 N. Wabash Road, Marion, Indiana 46952, on Monday, February 4, 2019, at 11:00 A.M. with Pastor Tim Purdom officiating, there will also be a one hour calling before the funeral service from 10:00-11:00 A.M. at the church. The burial will be taking place directly following the funeral at Riverside Cemetery, in Gas City, Indiana. Contributions made in honor of Homer may be made to the funeral home to help the family with expenses.